(Nanowerk News) With this new view of a spectacular stellar nursery ESO is celebrating 15 years of the Very Large Telescope — the world's most advanced optical instrument. This picture reveals thick clumps of dust silhouetted against the pink glowing gas cloud known to astronomers as IC 2944. These opaque blobs resemble drops of ink floating in a strawberry cocktail, their whimsical shapes sculpted by powerful radiation coming from the nearby brilliant young stars. This new picture celebrates an important anniversary for the Very Large Telescope - it is fifteen years since the first light on the first of its four Unit Telescopes, on 25 May 1998. Since then the four original giant telescopes have been joined by the four small Auxiliary Telescopes that form part of the VLT Interferometer (VLTI). The VLT is one of the most powerful and productive ground-based astronomical facilities in existence. In 2012 more than 600 refereed scientific papers based on data from the VLT and VLTI were published. Interstellar clouds of dust and gas are the nurseries where new stars are born and grow. The new picture shows one of them, IC 2944, which appears as the softly glowing pink background . This image is the sharpest view of the object ever taken from the ground . The cloud lies about 6500 light-years away in the southern constellation of Centaurus (The Centaur). This part of the sky is home to many other similar nebulae that are scrutinised by astronomers to study the mechanisms of star formation. 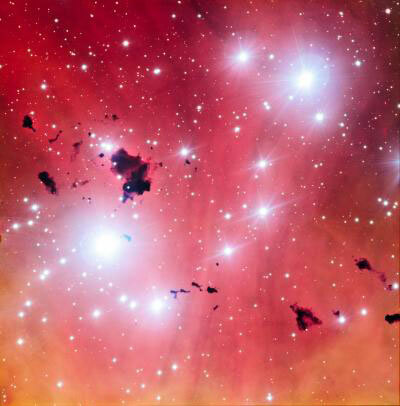 Larger Bok globules in quieter locations often collapse to form new stars but the ones in this picture are under fierce bombardment from the ultraviolet radiation from nearby hot young stars. They are both being eroded away and also fragmenting, rather like lumps of butter dropped into a hot frying pan. It is likely that Thackeray's Globules will be destroyed before they can collapse and form stars. Bok globules are not easy to study. As they are opaque to visible light it is difficult for astronomers to observe their inner workings, and so other tools are needed to unveil their secrets -- observations in the infrared or in the submillimetre parts of the spectrum, for example, where the dust clouds, only a few degrees over absolute zero, appear bright. Such studies of the Thackeray globules have confirmed that there is no current star formation within them. This region of sky has also been imaged in the past by the NASA/ESA. This new view from the FORS instrument on ESO's Very Large Telescope at the Paranal Observatory in northern Chile  covers a wider patch of sky than Hubble and shows a broader landscape of star formation. The seeing of the blue image in this colour combination was better than 0.5 arcseconds, exceptionally good for a ground-based telescope. They were discovered from South Africa by the English astronomer [A. David Thackeray] in 1950. This picture comes from the ESO Cosmic Gems programme, an outreach initiative to produce images of interesting, intriguing or visually attractive objects using ESO telescopes, for the purposes of education and public outreach. The programme makes use of telescope time that cannot be used for science observations. All data collected may also be suitable for scientific purposes, and are made available to astronomers through ESO's science archive.